Use the best materials (real silk ito instead of shoelacey cotton, buffalo horn reinforced saya, all IRON fittings instead of snap between your fingers weak zinc alloy), the best forge, the 'best' traditional Katana blade geometry for cutting power and build it on a solid 1060 carbon steel monotempered blade. I have got to know these swords very intimately. As with all big things, it started small. And this is a review of the Dojo Pro Katana that started it for me. The Dojo Pro Model #002. There are over a twenty different Katana design configurations to choose from in the Dojo Pro Katana series by Ronin Katana. But the differences are skin deep only, all swords have the same basic characteristics and there are only a handful of models that have non standard blades - such as slightly shorter, longer, more curved blades, a couple of models with bo-hi (fuller) and some Wakizashi and Ko Katana. 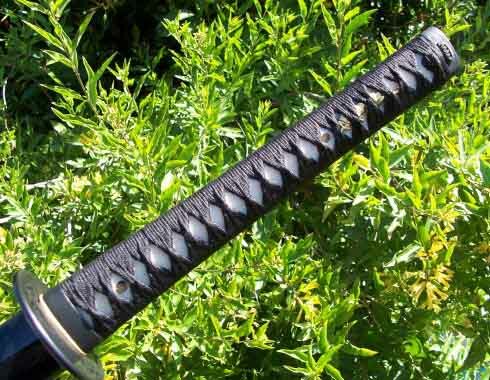 Deciding to get a sword that could broadly represent as many others as possible, I narrowed by selection down to the classic series (standard 28" blade, all models the same - only different tsuba, ito color, saya, etc) and just picked one from the selection that I liked: the model #002. There aren't that many Katana makers in our price range that actually just get it right when it comes to the tsuka (handle). Usually they mess at least one thing up. But Ronin did not on their Dojo Pro series..
You see, a Katana is only as good as it's weakest point. Putting a great blade in poor fittings means you need to change the fittings to really use it to it's potential. But this sword is good for the dojo straight out of box. 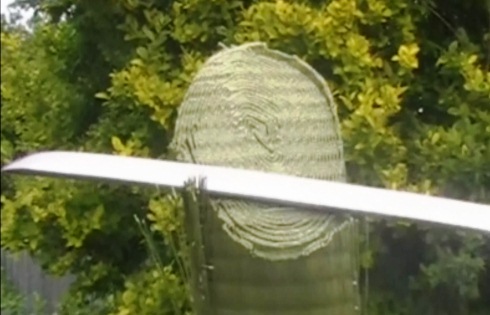 For a start, the tsuka itself is really well shaped - it's not an oversized block of a thing, it actually feels very ergonomic. Furthermore - where every other sword in this price range is using synthetic something (leather, rayon, etc) or shoelacey cotton - they wrap it in silk. But it is the little things like wrapping it in a traditional alternating manner (which makes the whole thing stronger and less prone to unravel) that you see the difference. And these little things add up into something substantial..
Add to this real rayskin and a nice brass menuki and already it is head and shoulders above any other sub $300 Dojo grade cutter. 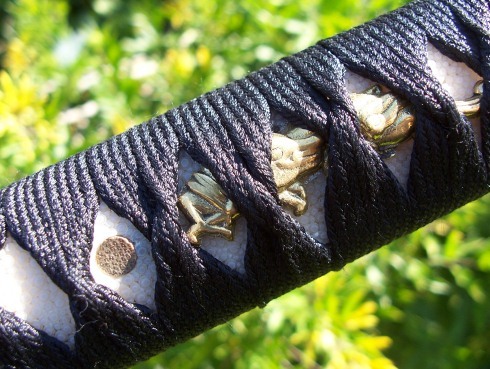 Though what the menuki is on this particular sword, I really cannot make out. Another thing they have done right is the use of solid iron in the tsuba, fuchi and kashira - reinforcing the whole assembly as strongly as possible. Like I said, it all adds up. Prior to shipping, each sword is given a good once over to make sure the fittings are rock solid, and this one was no exception. Probably the only thing that I can fault is that the ito diamonds are not completely even looking, slightly distorted by being pulled tight. But if that is all I can fault, I am scratching to find something wrong.. 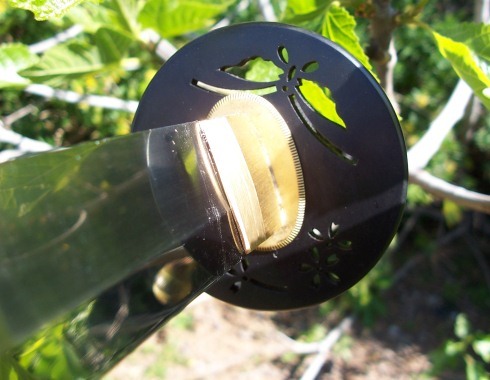 The tsuba is solidly made, because it is iron it's about as strong as a tsuba can get, and like all the tsuba Ronin used is a replica of an actual Edo era antique - in this case, a butterfly..
Oh, and another nice touch - the use of higher quality seppa (spacers) instead of those awful looking 'cog' things..
You can also see the close fit of the brass habaki and see how well it is aligned to the blade. When you add all of these things together you begin to see the attention to detail that I was talking about. All of the fittings are very high quality, and to see them all combined on a sub $300 Katana was (and still is) groundbreaking. But the good fittings are not limited to just the handle. At first glance, the saya looks pretty standard. But like with the fittings, you need to look a little closer. 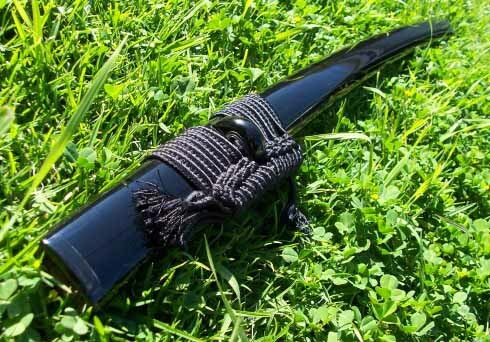 Because unlike pretty much every other saya in this price range, it features real buffalo horn reinforcements to the mouth and the end cap, plus the kurigata (knob where the sageo cord goes through) is also buffalo horn. 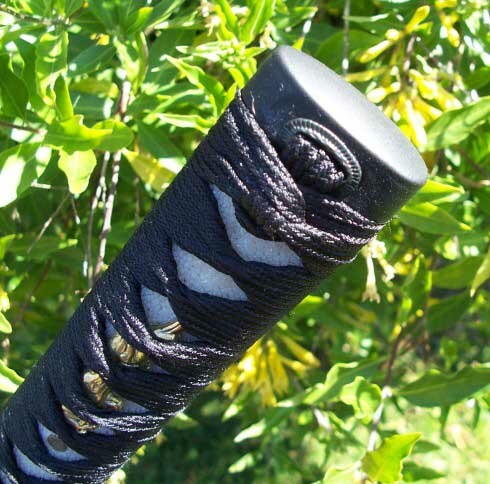 The sageo cord itself is great quality – the kind of hard wearing thick sageo demanded by martial artists to tie the saya to a belt instead of the ususal shoelacey stuff. So far, it was looking quite exceptional. But naturally enough, just as if a good blade is mounted in bad fittings it's not a good sword, a bad blade mounted in good fittings is ridiculous. But the thing with the Dojo Pro is, the great fittings are just the icing on the cake when compared to the blade itself.. The blade of the Ronin Katana Dojo Pro is quite unique. Looking at it, you can see it has a more viscous geometry than a standard Katana. It's beefier and kind of reminds me of a scythe. But another thing I like about it is that it is brutally honest. It doesn't bother with a hamon because the owner of Ronin Katana doesn't thinks a monotempered cutter like this should not have to fake one. But what is interesting is that every now and again, one appears with what has been affectionalty known as a 'ghost hamon' during the tempering - it's a purely cosmetic occasional by product of the tempering process these swords are subjected to and is highly desired, but it's just the luck of the draw. If you get one, it's a bonus - but it's subtle, and you may need to search for it. Mine did not have one, most don't. But while plain and unadorned, it has a certain deadly beauty to it and an even, hand polished finish. I'm not sure if you can see it in the pics, but these swords have quite a lot of niku (meat) to them. This is intentional, while historically Katana were often tested on the bodies of condemned criminals, Dōtanuki were tested on ARMORED opponents..
What's interesting is though that while these swords are certainly not ballerinas, they are definitely not clumsy. It's actually kind of hard to describe - they are definitely well balanced. 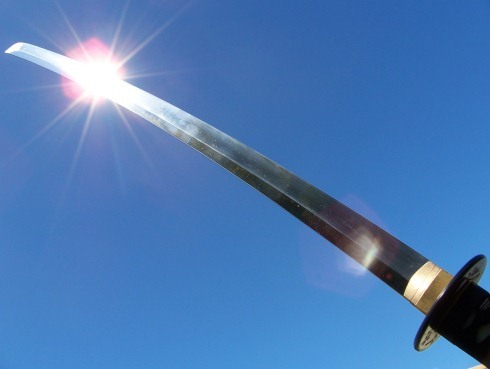 But when you hold one aloft, you get a sense that you would really NOT want to get in front of this sword when it comes down. I had tested a Dojo Pro on the usual kind of targets for a few months before I found the time to really give it a solid workout. It was a joy for standard cutting - a real slicing and dicing machine, bisecting water filled bottles by the hundreds and cutting single tatami mats with a one handed, casual swing.. But that's run of the mill for this blade - and considering the Dōtanuki heritage, there should be no surprises there. Plus you've probably seen vids like that a hundred times before.. So to try and give you some idea of how hard wearing it is - I took it down to a grove of wild bamboo to do a little pruning.. In Longquan with the owner of the forge, Jack Zheng, and Chris Scoggin we took a Dojo Pro to some super thick bamboo. You can see how Jack did. Chris and I found the bamboo pretty intimidating, but after mangling it for a while got the technique down. It actually ended up turning into LOT of pruning - because after around half an hour of cutting around 100 or so lengths of fresh bamboo – not only were the cuts consistently VERY clean, but the edge showed no sign of dulling so I just kept on going (even my girlfriend at the time who was filming had a go off camera and she sliced with even less effort than I did, let the blade do the work and got the same or better results... typical!). 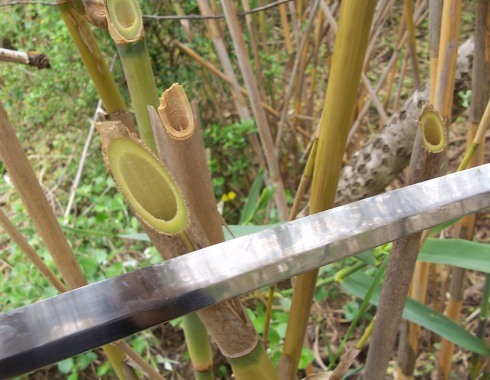 Anyway, here's a few highlights from that cutting session – note how easily it cuts multiple bamboo rods in one sweep..
All in a days work for this savage blade. (Achoo). But it wasn't just the bamboo that got pruned..
A 5" wide tree branch was also cut with a single slice and went right one through as if it wasn't there.. This kind of blade is actually kind of scary..
And after experiencing some of its cutting power, I decided to up the ante. I had never cut a triple mat before. The closest I had come was double mat cutting with a Cheness Specialized Goza cutter.. But after a taste of what this blade can do, I had to see if it could cut a triple mat like the Cold Steel Katana in the 'proof' video but without muscling through to see if the blades weight and geometry could do the trick. I started off with some single rolled mats - it cut them easily enough, though my first cut was a bit messy..
And when I actually faced a triple mat for the first time, it looked incredibly intimidating.. 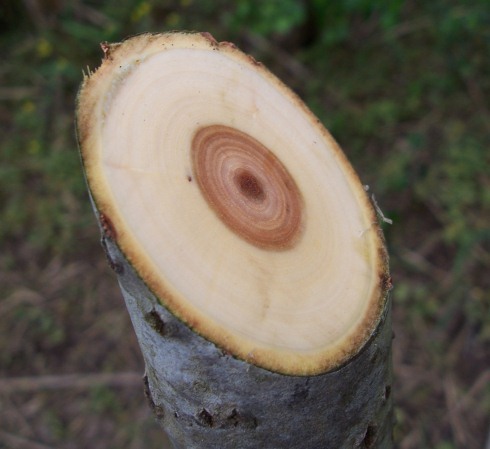 But I reminded myself I held in my hands a 'torso cutter' and knew how easily it cut the 5" tree branch. I can't be certain how closely this represents a human torso. But I can say that it would almost certainly be slightly tougher than a human neck (as a single full mat is supposedly as hard to cut as a naked human arm). What I can say is - well, check the video and see for yourself..! Same as the Cold Steel triple mat, but no power required.. Scary stuff indeed.. Even when thrusting, the tip - which I failed to mention previously because I was so excited about the sword generally - went right through three mats and stuck out the other-side due to it's reinforced, diamond shape. .
And honestly, when you look at a picture of how thick a triple mat really is and have a general sense of how dense they are - it becomes all the more impressive. By the end of these tests, I had a new found respect for this Katana. 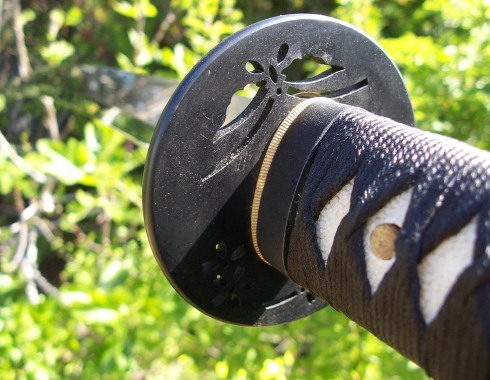 This is a blade that you would most DEFINITELY want to take into battle, and now I understand that during the more genteel Edo period, this design was actually outlawed by the Shogunate! 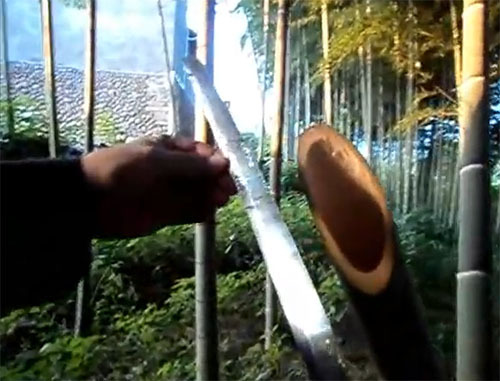 It's my firm opinion, having tested these swords under a variety of conditions and against a variety of targets (including thick bamboo in Longquan, China) that in the sub US$300 price point they are in a league of their own. And I am not the only one, some members of the sword community have tested them even harder than I have - and they keep on keeping on like a champion.. The blades are terrifying. The fittings, superior to anything else at this price point. And the price, well it's almost too good to be true. I honestly have not been this impressed in a sword for a long time (in fact, I am loathe to reveal this - but when I once lived in a dangerous neighborhood, it was this Dojo Pro that was the last weapon of resort next to my bed).. Seriously, if it's a solid dojo level beater you are after, you can't miss these. Check around, I think you'll find that the stories are true - the Dojo Pro cannot be beaten and I endorse and recommend them heartily. The owner of Ronin Katana is very discriminating in who he allows to stock these swords. 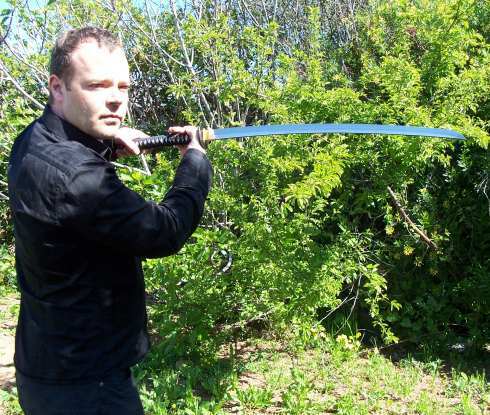 But I am pleased to say that after negotiations he allowed SBG to stock the full series right here at the SBG Sword Store so I can bring them to you for just $294.99. I stake my sites reputation on these - you will NOT be disappointed.